Who are we? - Retreats in the South of Spain! I have 17 years experience in counselling, due to my work in midwifery and my work 'on the side'. I use a mix of different methodes/techniques. Thetahealing, intuitive counselling, non-violent communication techniques, clearvoyancy, bodyscan-method, meditation techniques and gestalt therapy (also tarot, homeopathy and astrology I can use when requested). From a young age I've been clearvoyant, but I've only started using this in my work over the last 5 years. And how enriching this is! I also gave courses to colleagues, to help them see their fears and learn to confront these, which helped me to get familiar with group work. I am married with Eric Kemna and we are living with 3 of our children in in Spain. We have travelled all over the world and eventhough we are all very different people, I feel like we are truly living and working together very well. You can find more about me, through my website. You will meet Tanja during the retreats; she will participate in groups sessions and individual sessions, using her intuition and the various techniques she learned along the way. "Renske van der Zeeuw lives her life with what 'is' -in the moment- and to 'let it be'. Expressing, accepting, letting go and the use of creative power are important themes with which she works. Since about five years she only works from the source / higher plan / love. In these years she gave energetic consultations, individual & group sessions, shamanic drum circles and created a heart labyrinth of 20 meters in diameter. Mediumship, natural, intuitive and egoless leadership & artistry characterize her. Renske has been a dedicated mother of two wise people for the last three years. She also has a background as a mentor, singing, music and theater teacher. " Renske lives on land with her children, as do Tanja and Eric. She will be present at group sessions and she will also take care of individual sessions in her own way, following her intuition. As I describe who I am, I do it with the idea that this description is not permanent. This is how I see myself at the moment and tomorrow may be something different. I enjoy exploring hidden and stagnant emotions, I have fun adventuring into the unconscious layers of self, and I feel called to break down suffocating belief systems. When I delve into the truth no matter the consequences I feel alive, connected and in resonance with who I truly am. In the physical realm I am a woman and I have seen 51 winters, I have been guided and taught by 2 lovely beings, my sons who, at the time of writing, are moving into manhood (a trying period). And I have been sharing the last 18 years of my life with a man who consistently encourages me to see that which I don’t want to look at!!! 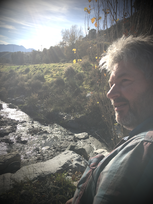 Born and raised in the UK, studied in the USA, 23 years in France and now in the south of Spain I have seen, experienced and integrated bundles of wonderful things that I would like to share with others. I am not a master nor a teacher, just a fellow being who has ventured far from home and has lots of stories to share, and am eager to hear and participate in the stories of others. Nikki has studied to be a shiatsu practitioner, but is now mixing all she learned into another form of 'being' with people. She is always pulled to go deeper and come up with new ways of healing herself and helping others heal. She will do the groupsessions and individual sessions in the ways that come to her in the moment. My name is Eric Jan Kemna, I am 58 years old, father of Beer, Lem and Mar and already 21 years together (and even married since a couple of years) with Tanja Smeets. From an early age on, I was always working on technology and I had - so called- 2 right hands (loved disassembling things and putting them back together). After I followed the Retail and Trade School, I became a teacher in motor vehicle technology (for example, I gave trainings to Fort and Mazda mechanics). In my own business - which I started when I was 33 - I could use my technical insight and love for negociating and trading. Yet at the age of 40, just after the birth of our first son, my life got thrown around. I got 'stuck' within myself and in the relationship with Tanja. This is when I started with my personal development. For example, I followed courses (loving yourself, Vipassana, etc), learned to meditate, wrote diaries full with my experiences and discovered my emotional life. This led in 2004 to the sale of my business and the departure, with my family, to New Zealand in 2005. At that time I became a full-time househusband and worked on myself a lot. Later I discovered a new hobby; building with natural materials, such as adobe in situ, and since then I've been looking for opportunities to use my creativity in this. After many travels with the five of us, we ended up in Spain and found a piece of land where I intend to express my creativity. For the first retreats, my task will be; building the accommodation, logistics, cooking, shuttle service, handyman, organization and finances. Eric has enjoyed cooking his whole life. Indonesian, Tai food or just freshly cut and fried French fries; nothing is too crazy for him. He will take care of the delicious, vegan meals of the first 2 retreats. In the retreats hereafter he will also give a group meditation and provide a few afternoons or mornings 'building with natural materials (like strawbales, bottles and clay)'.